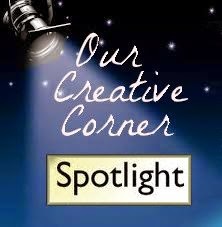 Welcome back to Our Creative Corner....Laura here with the final Spotlight of the month! And I decided to make my first ever chunky ATC ! Then when it was dry I painted it with Nougat Fresco paint and when that was dry I blended some Walnut Stain DI all over it. 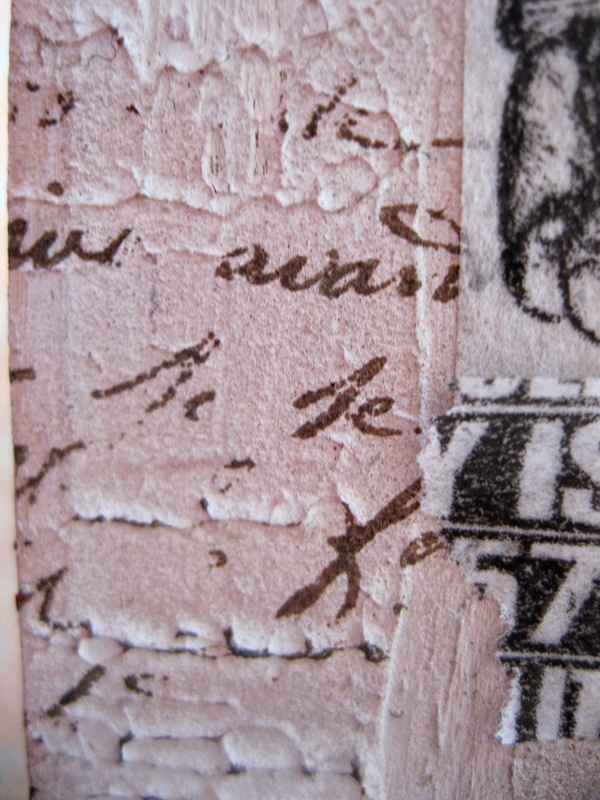 The Tando heart was covered in text paper and inked with Antique Linen DI and then had Decoart one step crackle applied. 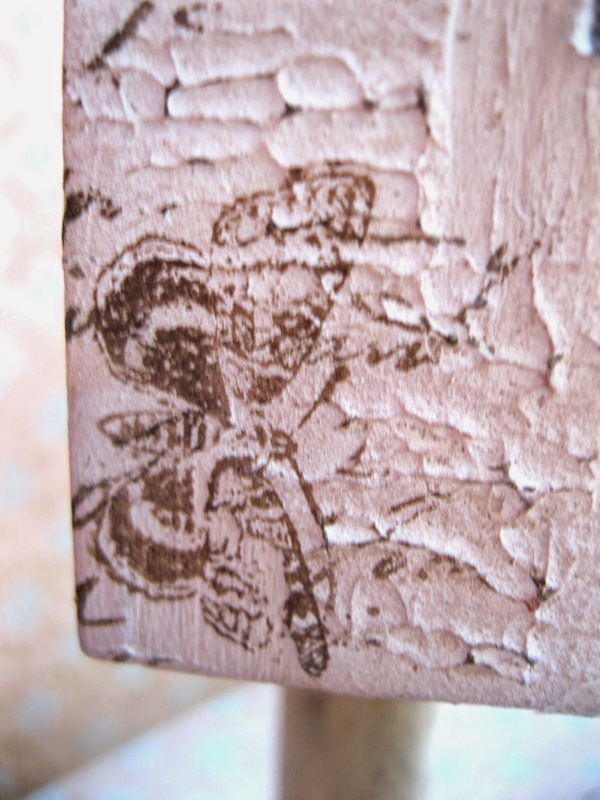 This was then inked over with Walnut Stain DI to enhance the crackle effect. 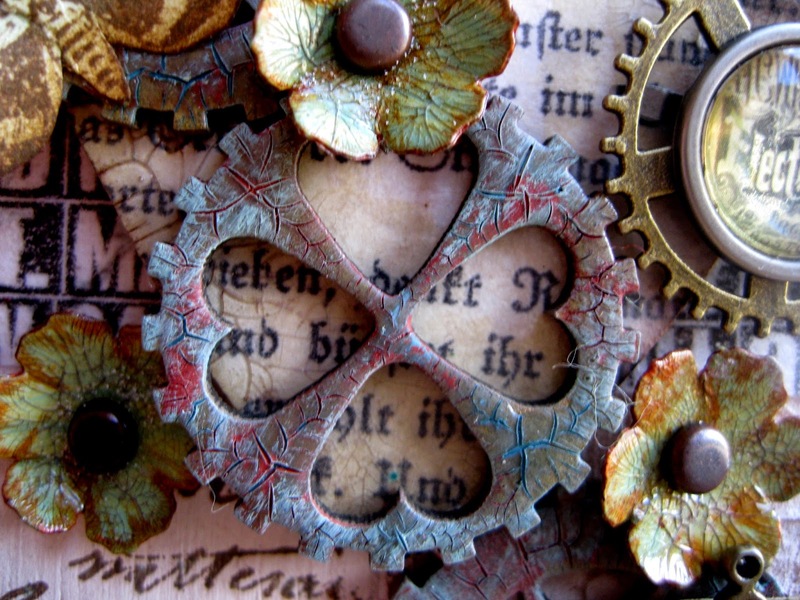 The cogs were painted with Old Gold Fresco Paint then covered with crackle glaze. 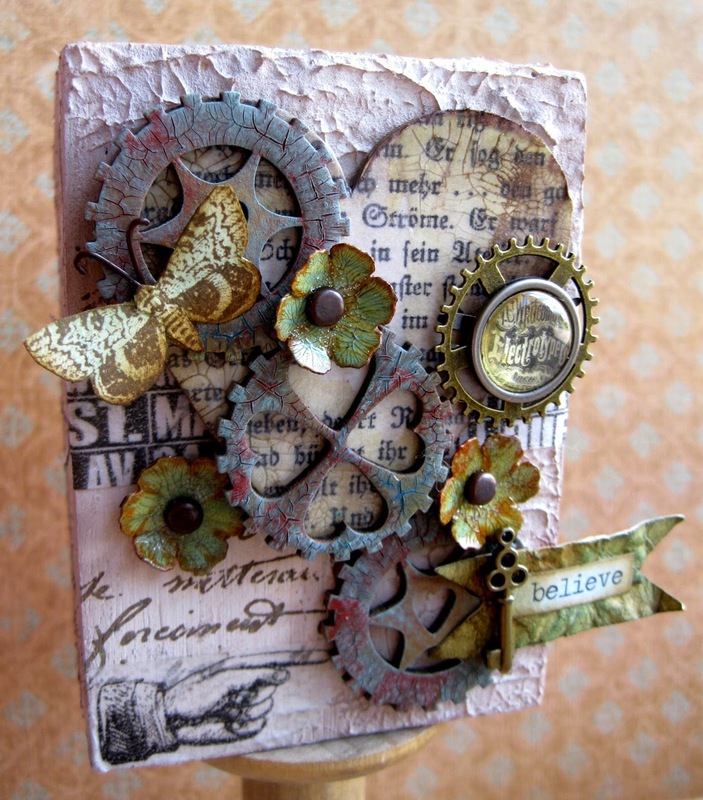 When this was dry I added a few layers of Decoart Media Antiquing cream in Patina Green and English Red Oxide. When dry I dabbed the excess away with a baby wipe. I then dry brushed a mix of Bora Bora and Guacamole Fresco paint over the top. A strip of card was inked with Evergreen Bough and Vintage Photo Distress inks and a chit chat sticker was added. A small brass key was attached to the card. I stamped the butterfly onto card, inked with Evergreen Bough and Vintage Photo DI's and then cut it out. 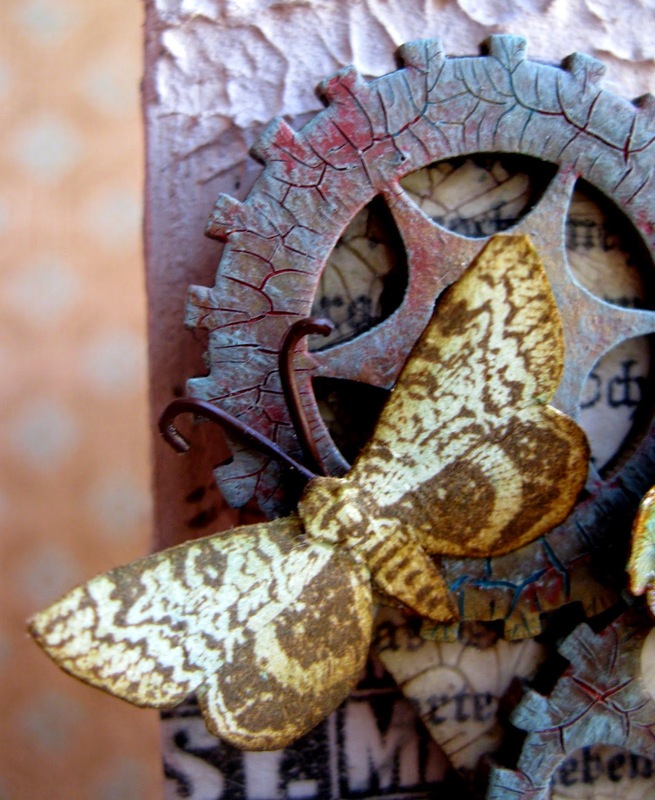 I stuck the butterfly onto one of the cogs. If you like Tando items then why not enter our current challenge - one lucky entrant will receive some Tando goodies! All you have to do is enter the Autumnal Inspiration Challenge hosted by Claudia - there are still a few more days left - come and dive right in! I will be back here on the 1st October with a brand new challenge for you! Don't forget to come and find out what it is! This month we are shining the spotlight on the winner of the 'Homemade Flowers and Hand Dyed Ribbon' Challenge that was hosted by Astrid! Julie is a second time winner here at Our Creative Corner. She won previously for her gorgeous butterfly canvas in February! When someone wins at the OCC three times they are awarded a Gold Winners Badge! 1. Is there something you wish you were better at? I envy people that can draw and paint a picture. My paintings and drawings still look the same as when I was at Primary School. 2. If you had a time machine, what historical figure would you love to see in 21st century life? There are several people I would love to meet past and present but one of the historical figures that has always stood out for me since I was a child is Joan of Arc. 3. Whats the most unusual thing you've ever eaten? This I had to think about as I am not very adventurous at trying new foods. But probably a frogs leg which a chef talked me into trying a little bit of....never again ! 4. What supply wouldn't you do without when it comes to stamping? I couldn't do without my go to background stamps of crackles, leaves and script they are always lying on my desk should I need to add an accent onto something. 5. Are you a day-time or night-time crafter? I tend to craft in the afternoon but have been known to do a night shift crafting. Sometimes I wake up in the middle of the night with an idea and can't get back to sleep as I keep thinking about it. So I give up trying to sleep and get up and craft. 6. Do you work on more than one piece at a time? Occasionally if it is a large project, otherwise I tend to finish what I have started before moving on to the next thing. 7. If you had to move to a state or country besides the one you currently live in, where would you move and why? Majorca is a place where my husband and I have lots of wonderful memories and for the warmer climate. I also have a great love for York in England, it is so steeped in History I never tire of this place. 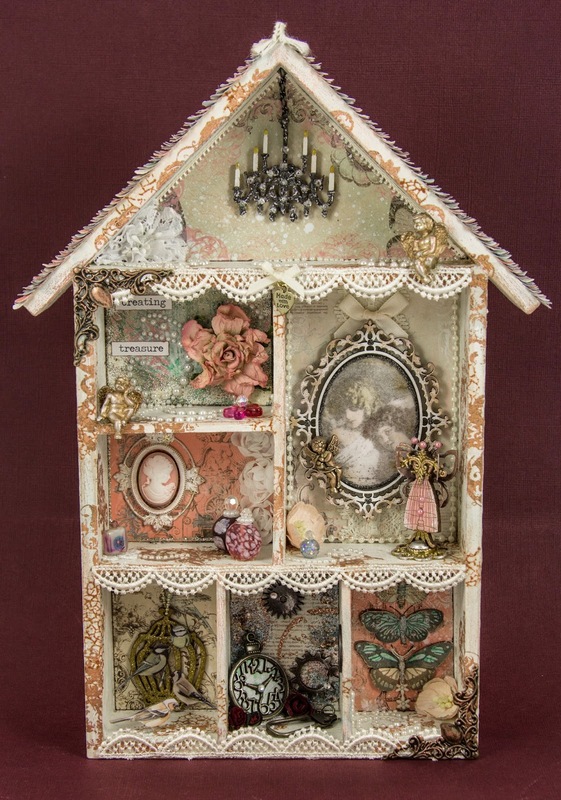 Now let's see what Julie made for her second time in the Our Creative Corner Spotlight!!!! This is so beautiful Julie! As always your work is so full of detail! - It is always such joy to see your work and it has been such an honour to feature you today at Our Creative Corner. 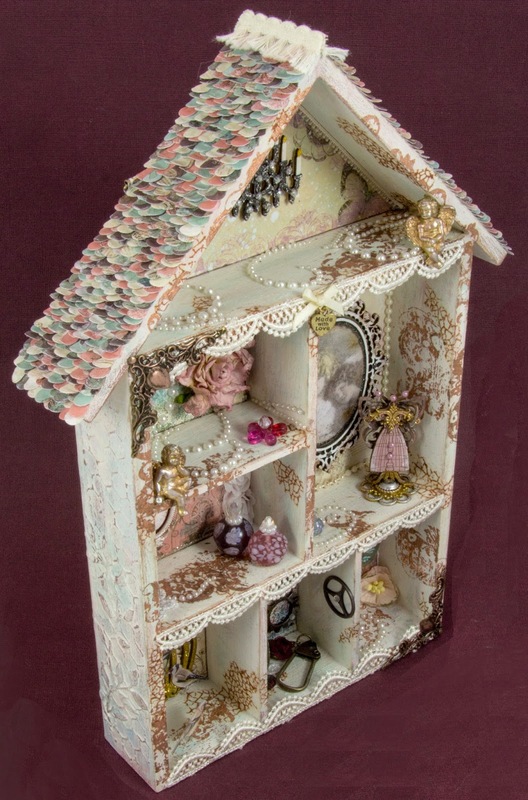 If you want to see more photos and details of this wonderful creation and find out how it was made, then please go along to Julie's blog Juliz Design Post and say "Hello" - I am sure she would love to see you there! All you have to do is enter Claudia's Autumnal Image Inspiration challenge. There is one more week of the Autumnal Image Inspiration challenge left, so why not have fun creating! If you haven't already seen Julia's fantastic project, I highly recommend you scroll down (or simply click the link) to find out what she made of Tando's advent calender (who would have guessed it was so versatile?). 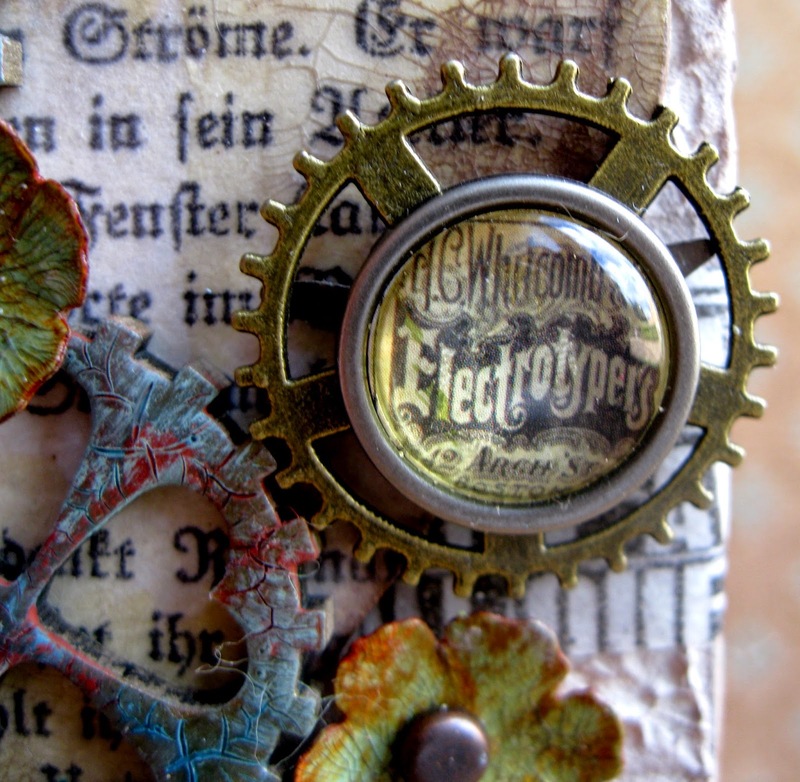 I had a massive play with a lot of the new DecoArt media stuff (you'll find a list of all the materials I used at the bottom of this post) and accidentally "invented" a cool technique to create a kind of "splintered enamel" effect. it looked quite "nice", but was too small, so I was very happy to find that the largest of Tando's "3 Clocks in 1" fit perfectly as a kind of outer frame. I only had to build some framework to attach the clock face. 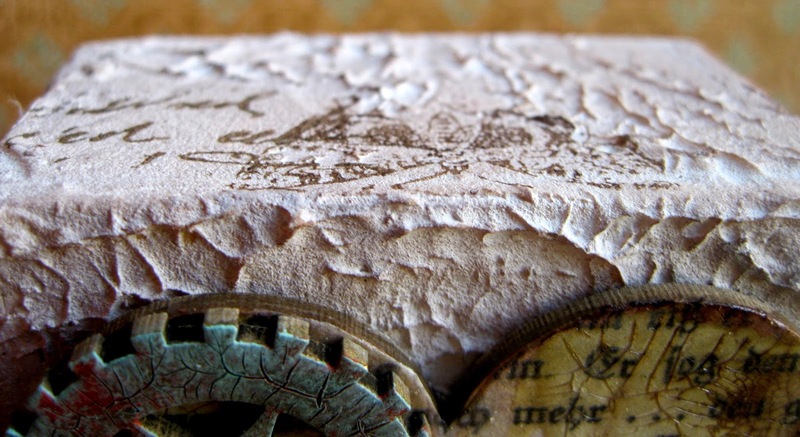 So I used some small pieces of wood (left from a very small canvas) and glued six of these to the back of my small clock - using DecoArt matte Decou-Page. Then I covered my clock and the Tando piece with a layer of DecoArt's black Gesso from the new media line (don't worry if there are any brushstrokes visible - these will be covered later). Once this had dried, I gave it all a coat of DecoArt media "Matte Medium" to seal my surface for further treatment. The Matte Medium spreads really easily and goes a long way! It is also fast drying, so I didn't have to wait or speed up the process with the heat tool (which I wouldn't recommend anyway as this can cause nasty bubbles when acrylic colours or medium are getting too hot). I prepared some colour washes for the next step, using DecoArt media fluid acrylics Transparent Yellow Iron Oxide, Raw Umber, Titan Buff and Quinacridone Violett. Then I got out the new DecoArt media white Crackle Paint and started painting only a small area of my clock at one time - as the crackle paint dries rather quickly, painting the whole clock would leave you with dried paint - which will prevent my technique from working! Allow your sprinkled on colours to mix and create random colour effects. Don't dab any of the large puddles dry until the crackle paint has done its magic!!!!! Once the crackle paint has dried completely, take a piece of kitchen roll and dab off the wet paint from the larger stains - this will remove the diluted acrylic colours AND the crackle paint and reveal the black colour from underneath! You can also see how the black Gesso underneath the white crackle paint makes the cracks more visible! This will create an uneven edge that looks a bit like splintered enamel too. I did this with both - my clock and the Tando Clock frame - first applying the lighter colour and then the darker - trying not to work too evenly. I hope you like my "splintered enamel" technique!!! 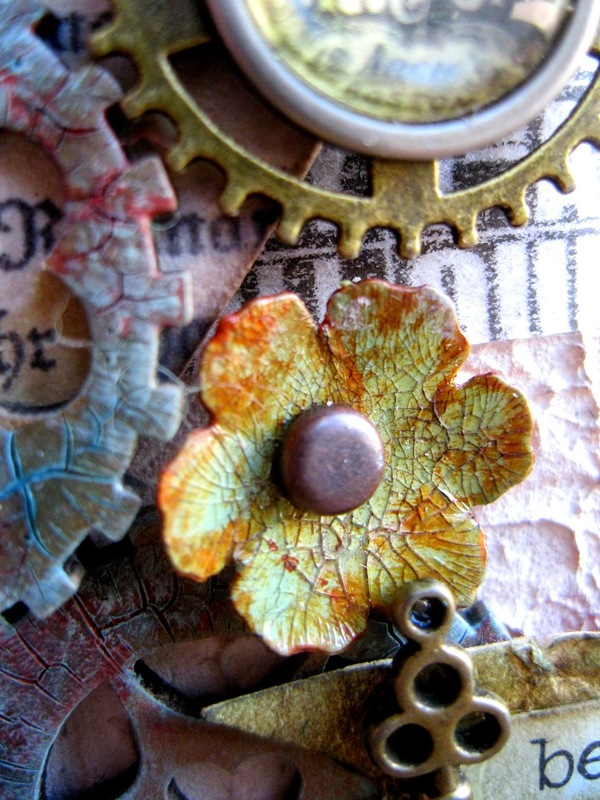 - Tando Creative "3 Clocks in 1"
As it is only a few days past mid-month, I would like to remind you of my actual "Autumnal Image Inspiration" challenge over here at Our Creative Corner, which is still open until the 28th of the month! I would be sooo happy to see you join in!!! Servus and welcome back to Our Creative Corner, dear creative friends! Claudia here and today I have the (very) great pleasure to introduce to you this month's Guest Designer - Candice aka Tincan Crafter! So you can imagine how happy (and proud) I was when I found that she said "yes" to the invitation for this guest designers spot! 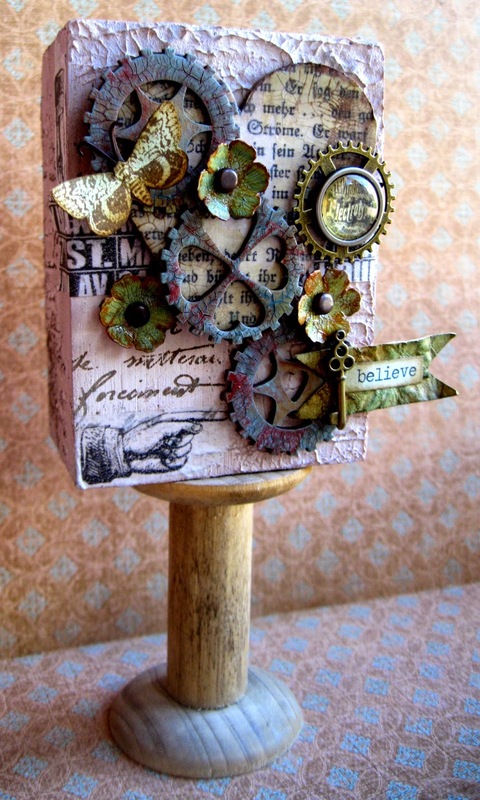 But now I leave the stage for our oh so special guest - please, welcome Candice, the Tincan Crafter! Applause, applause, applause (*doing the Kermit the frog wave about)!!! 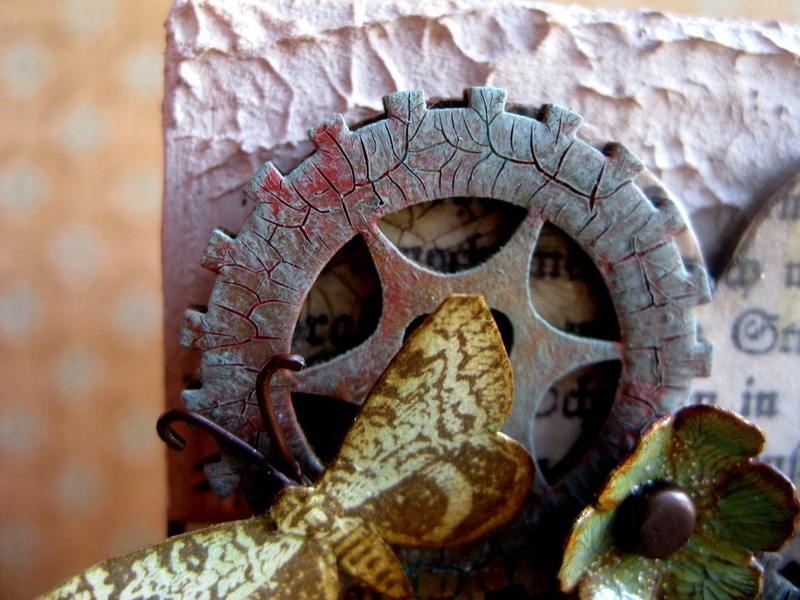 I have been holding onto an almost unbearable secret for a few months…..
A couple of months ago I was invited to be a Guest Designer for “Our Creative Corner” for September. I was completely floored and excited and so very honoured to have been asked to participate in this way. I was challenged to take inspiration from this picture collage as featured at the start of the month. Right off the bat, the knotty tree bark and the vine just jumped right out at me. I decided to create “The Sacred book of Runes” as my feature project. I bet you are thinking – how in Odin’s name did you find a piece of bark big enough to cover a whole book? I didn’t!! I have an insatiable need to experiment – during one of those experiments I discovered a pretty cool way to create a bark like texture with texturising medium. So I am going to share my technique with you today as well as a few other crafty tutorials on how to make the burned Rune Scroll, Carved tooth Charm, Faux Suede straps and Precious Stones that I embellished the book with. A regular book or journal or whatever you want to turn into an old book of mystical charm. Bulking material to create the layered uneven bark bulk – In the past I have used ripped pieces of chipboard, bunched up masking tape, old linoleum flooring that I cut and distressed, basically I use whatever I have on hand, I am a little too into recycling junk into craft materials, so a lot of my ideas of how to create a specific texture really come from me trying to to recycle my house junk. 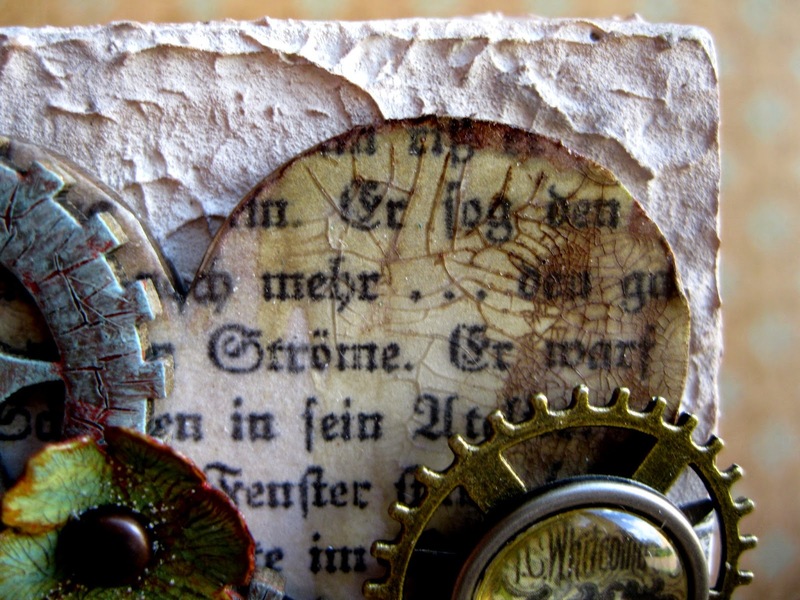 For this tutorial I used ripped pieces of chipboard. Paint or Universal stain in brown and black. Texture paste. I am a big fan of Dala texture paste (South African Brand)and buy that by the bucket loads but I am aware that Claudine Helmuth and Ranger also have their own brands of texture paste and I reckon those do exactly the same job. A skewer stick or toothpick or any pointy, sharp, needle-y type thing. Heat gun if you want to expedite the process. Get your book out. paint it brown if you want to. Decide how much overhang you want off of the book that you are altering. I didn't bother with too much overhang for this book. If you want a little overhang, cut a piece of bookboard or chipboard, that will serve the dimensions you have decided on. Glue this on the existing cover. A tip I should add here is that your book will open better if you have a bit overhanging over the edge of the spine, and you make the crease line where the book folds out to open. Cut another piece of book-board slightly bigger than that and rip it into strips. They don't need to be uniform. In fact if the edges are rough and and ripped and shredded – all the better, it will give you all the right irregularities of ordinary flaking bark. Start by gluing the strips down, some slightly overlapping, some short pieces, some long pieces some tapered pieces. You control the look and thickness of the bark bulk by adjusting your tear and layering pattern. Alternatively, you could stick bunchy strips of masking tape in a way that it creates bumps and ridges. 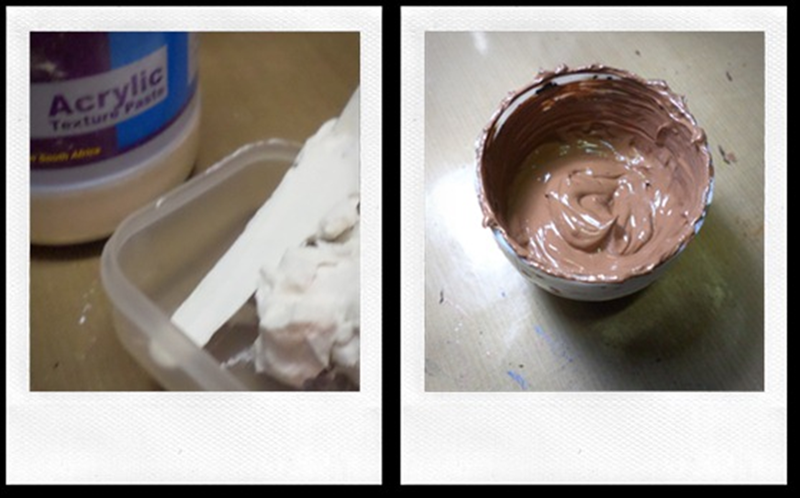 Scoop out some texture paste into a mixing container. You could colour that paste now with the Brown paint or Stain. Go ahead and spread that lovely chocolatey mess like icing/frosting on the book that you have covered in bark bulk. Use the palette knife to trowel it in all the little cracks between the glued pieces. Don’t worry about getting it smooth. Just plonk it down and make sure you have a good layer of coverage. Using the Palette Knife gently tap the texture paste icing in an up and down motion to create tiny peaks. Take a skewer and etch out random vertical lines. Let this dry thoroughly. You could speed things up with a heat gun that blows hot air not the one that is just heat. You can now take a makeup sponge or a sponge applicator and pick up some darker brown or black paint and burnish over the raised edges. This will create more dimension and make this look like real bark. Measure out a liberal amount of grout or cornstarch. Squeeze out some silicone. Mix and knead together until you get a pliable but rubbery texture (like crazy clay but denser and more rubbery). Manipulate it into little rock forms. Paint or dye it with alcohol inks or paint. You can also dust on Perfect Pearls for glimmer. For added oomph you can give it blast of clear lacquer spray paint to make it all shiny. 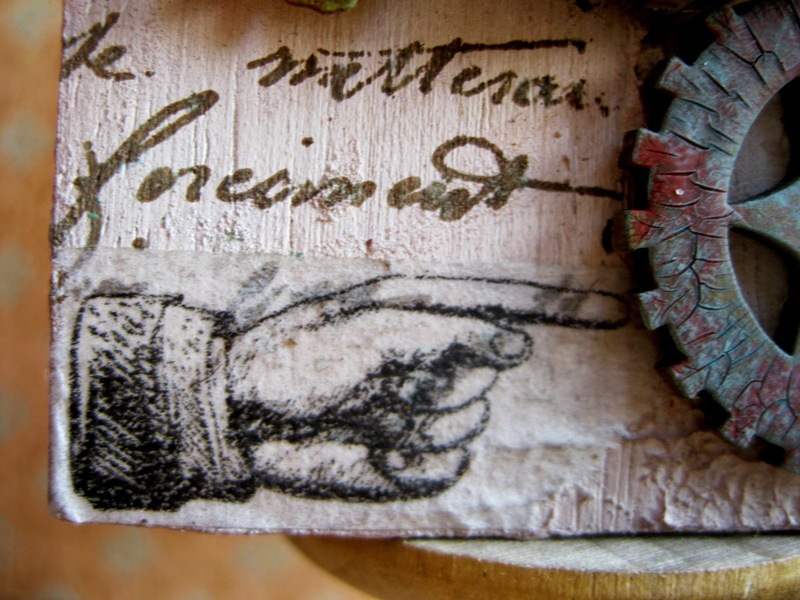 Stain paper with Distress Ink (you use whichever colour you feel your scroll should be. Write the Runic Alphabet on the stained paper or make up symbols that look Rune-like. Distress around the edges with Black Soot Distress Ink. To make singe-holes – hold a soldering iron to paper until it starts to singe and burn, if you don't have a soldering iron, a lit incense stick will work fine as well. Soak the foam in paint or stain solution or just paint it over the top. Leave to dry completely. Paint a layer of glue over the top. Sprinkle on cotton flock. Dry completely. You can adjust the colour by making a light misting spray and misting the strips. 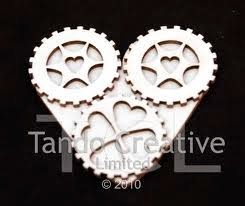 Use the lino-cutter to scratch or engrave the design into the bead. 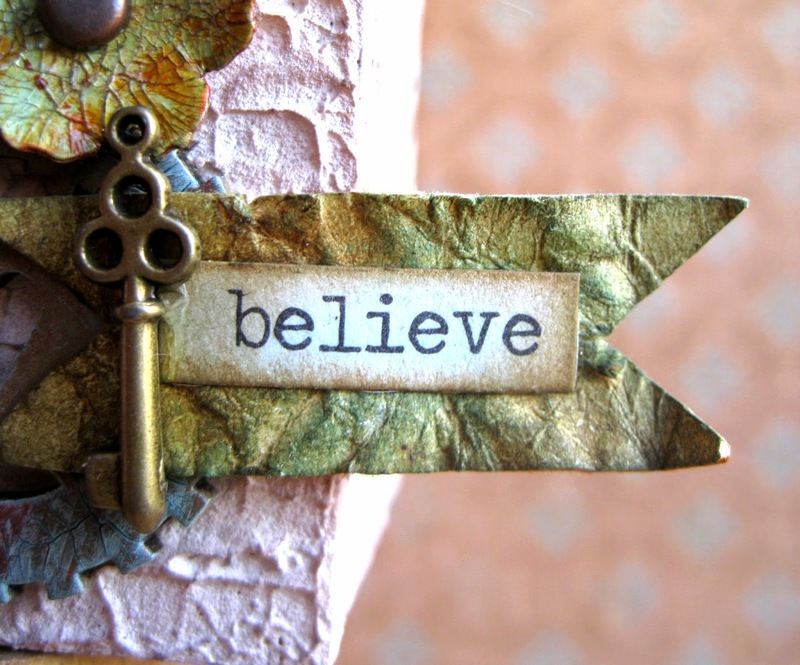 Swipe alcohol ink over the whole bead and rub off some of it so that it creates a worn distressed effect. To make the brown wood-like tooth – sand the bead, then apply walnut stain paint all over the bead. Now you can do steps 2 and 3 to finish the look. If you want it to be more polished – give it a blast of clear lacquer spray paint. And that brings me to the end. I hope you will give it a shot. Thanks again for asking me to be a part of such a fun challenge for such a fun craft blog. Dear players and readers, don't forget to join in our actual challenge with my "Autumnal Image Inspiration" - it is open until Sept. 28th, 11:55 pm and I would love to see you play along with me! Also don't forget to stay tuned for some wonderful Sponsor Spotlight Inspiration throughout the month! Tando Creative are our generous sponsor this time - so there will be a lot of Tando goodness to see! Yay!